Fire consumes TNT,but doesn't set it off. I wanted to blow up a mountain in creative for some building space. The TNT clears the mountain for me. After a while,all the TNT disappeared and the lava(I placed them to set off the TNT,since flint and steel can't be used in creative)flowed everywhere. 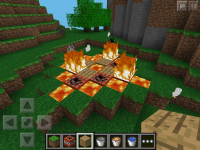 Later,I did an experiment to see how the TNT disappeared.It turned out that the fire(from the lava)consumed the TNT. 1. Place some TNT in creative. 2. 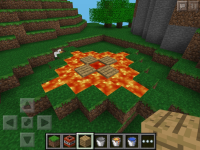 Place lava beside the TNT. 3. Wait for the lava to set fire to the TNT,the TNT will disappear after a short while.